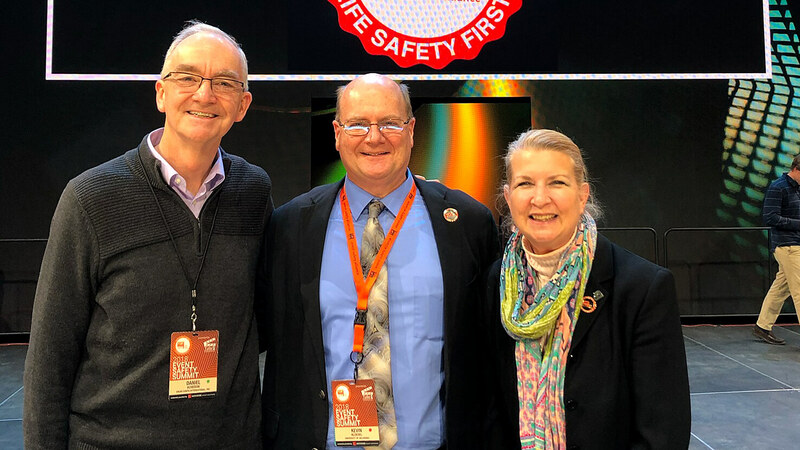 This week, Drum Corps International CEO Dan Acheson and director of event development Susan Kuehnhold participated in the 2018 Event Safety Summit in Lititz, Pennsylvania. Throughout the premier national conference of the Event Safety Alliance, November 28-30, the renowned organization provided intensive training on creating and maintaining safe environments and reducing risk for audiences and performers in live events. More than 25 industry experts covering all aspects of event planning and administration provided critical insights into the reality of ever-changing circumstances across the industry. Conference participants were able to learn advanced safety management techniques on topics such as weather hazards, event team management, security, emergency response, site-to-site travel, performer health awareness, medical risk management, and more. FROM LEFT: DCI CEO Dan Acheson, Dr. Kevin Kloesel of the University of Oklahoma Office of Emergency Preparedness, DCI director of event development Susan Kuehnhold. 2018 marked the third straight year that DCI staff members have attended the conference, with plans to continue to incorporate the wealth of information into its sponsored events and to disseminate best practices to the individual participating drum corps organizations for their programs as well. As DCI intensifies its focus on health and safety, DCI administration and corps leadership will also examine crucial safety topics during upcoming meetings in preparation for the 2019 summer season.